Title: 'Regni Poloniae et Ducatus Lithuaniae, Voliniae, Podoliae Ucraniae Prussiae, Livoniae et Curlandiae descriptio'. 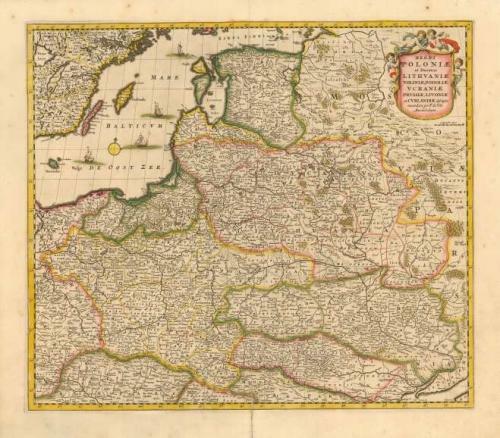 A finely engraved map of the region from the Baltic (including part of southeastern Sweden) south to Austria and Hungary and east to include the Black sea. The map is filled with detail of hundreds of tiny villages, forests, marshes, mountains and rivers. The title cartouche is held aloft by a host of putti and tiny ships sail the Baltic. Split on bottom fold with an old repair, else very good with beautiful original colour with slight oxidation.